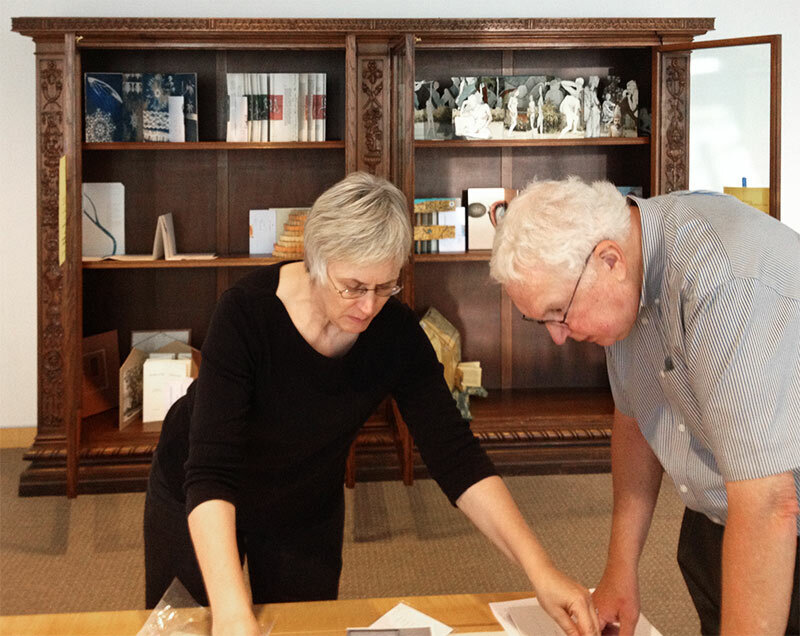 Yesterday Oola and I took BART to San Francisco to help install a show of handmade books from the Pacific Center for the Book Arts right there in Civic Center, in the Public Library. There was plenty of unpacking, lip smacking, list checking, and a little bit of worry that there wouldn’t be enough room for all 120 pieces. Terry unpacks in the back room. Saul continues the process carefully. I pulled a lot of guard duty, and Oola had the heavy responsibility of the bathroom key for a while. But…. 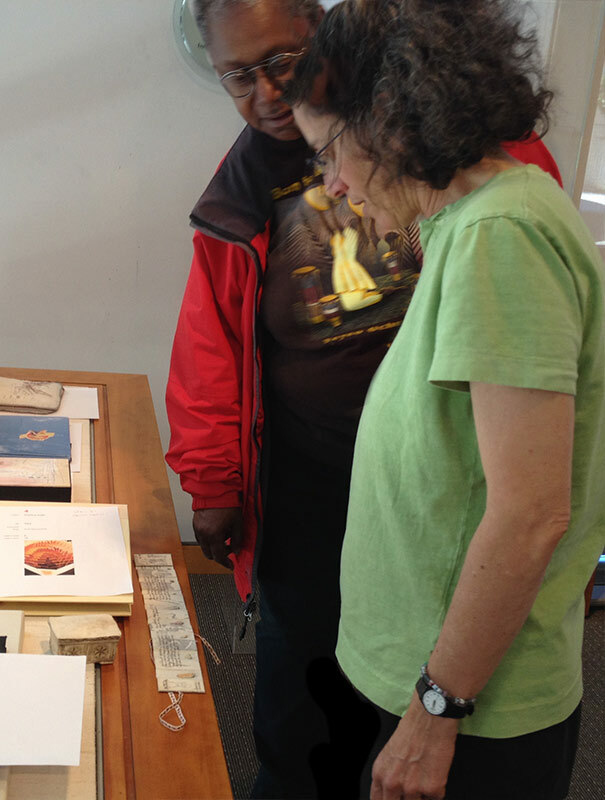 Judy shows momo her exquisite case and book of Kaddish. and a few situational encounters. How many book-people does it take to level a table? There were book installations big and small. Judith starts the installation of her work “Navigation”. Oola helps loosten up a kajillion strips of scotch tape which have lifted text from the body of a book. 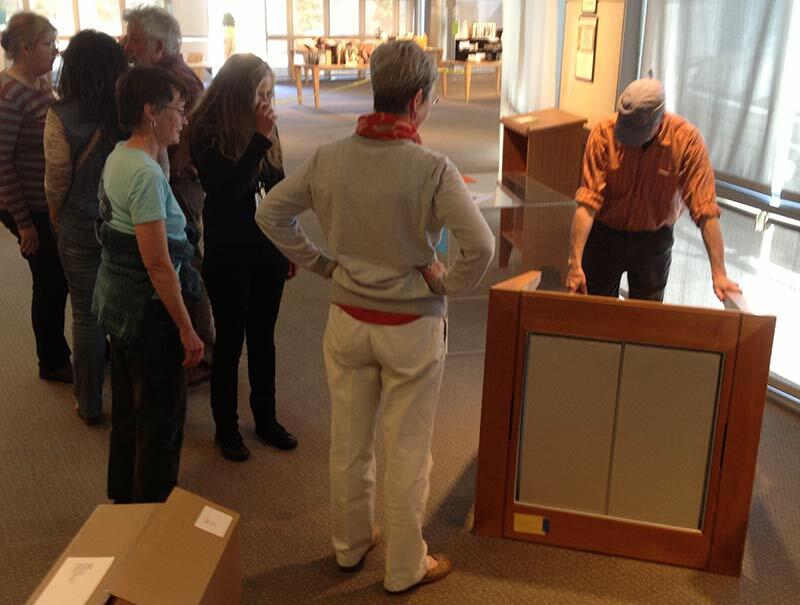 Just when we feared that there really wasn’t enough display space for all the work, Andrea – the Library’s guardian angel – produced more cabinets and tables. Cabinets saved from the old library, and they are magnificent! When Oola and I finally limped home there was still more work to do on the show. But all will be ready for the grand reception/opening this Saturday. Come by and enjoy! This won’t happen again until 2017! The show will be open until Sept. 6. Civic Center BART, take the station exit farthest west. You will find yourself across the street from one of the entries to the Library.